Bulbs are never-fail flowers at least for the first year of blooming. The bulb contains the embryonic plant within itself. Cut open an onion that has started to sprout, and you'll see that plant. Give bulbs the right conditions, and most have them will reward you with year-after-year of bright flowers. Daffodils are a spring time favorite with many gardeners. Daffodils have trumpet-shaped flowers with a frill on the end and five petals at the base of the trumpet. The flowers are one-to-a-stem and one stem from each bulb. Their scent is sweet, but not very noticeable, with the exception of paperwhites or narcissus. Daffodils naturalize easily, which means with the proper conditions the bulbs throw out baby bulbs to produce more flowers. Colors include yellow, orange, cream and a peach shade that's close to pink. Hyacinths are very fragrant. They have up to 50 flowers or more arranged up and down a stem that's 8 inches tall. The leaves, like most spring bulbs, are strap-shaped. Colors include white, purple, pink and dark pink. Hyacinths are not reliable bloomers year-after-year unless conditions are ideal. They require a chilling period to bloom. Tulips are the glamor girls of the spring garden. Choose from single and double flowers, flared and ruffled petals, contrasting colors or solid colors, and early, mid-spring or late blooming varieties. Colors even include blue with an undertone of violet. Like hyacinths, tulips need ideal growing conditions to re-bloom the next year. The Darwin type is one of the most reliable to come back year after year. Tulips require a chilling period to bloom. If you like huge flowers up to 5 inches across with three to five buds on a 18 inch tall stem, you'll love amaryllis, also called Bella Donna lilies. Not only are the flowers big, so are the bulbs--about the size of a small grapefruit. Amaryllis bulbs must be planted so the upper one third of the bulb is above the ground. They bloom in late spring to summer depending on location. They are not frost hardy and must be lifted before frost and stored. Agapanthus is another huge flower. Actually it's many small flowers that bloom at the same time on the top of the stem in a sphere. That sphere may be 12 inches in diameter. 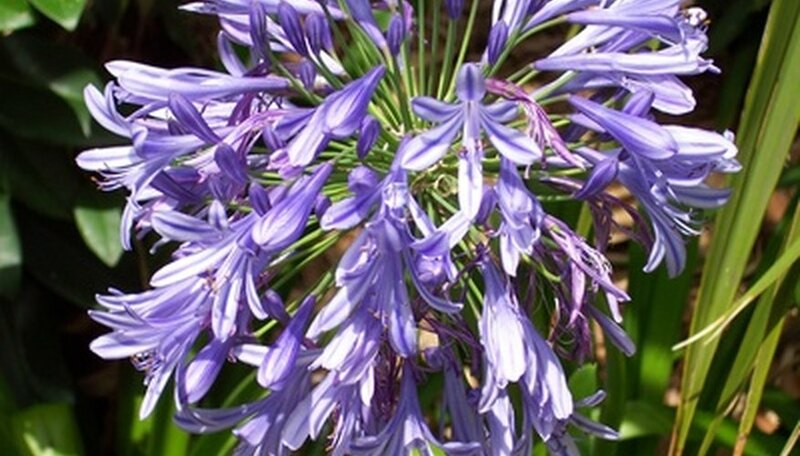 Agapanthus blooms in white and vivid blue. If you've ever seen chive flowers, or onions that have flowered, that's what the agapanthus flowers look like, only much bigger.